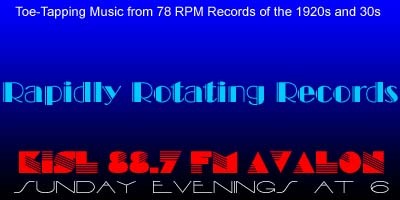 This edition of Rapidly Rotating Records was delayed due to computer issues, but they were resolved *relatively* quickly and inexpensively and we’re back up and running. Unfortunately, this show has some time sensitive information, but as they say, better late than never. I believe I’ve played a contemporary recording only once before, but there are several on this show. They’re played to alert you to recordings and appearances by Vince Giordano’s Nighthawks, Richard Dowling and Frederick Hodges. Thanks for listening and supporting these fine artists. Segment 1: Back to New York! The New Yorkers – Red Nichols and His Five Pennies / Red McKenzie, v.
Do The New York – Victor Arden – Phil Ohman and Thier Orchestra / Frank Luther, v.
This Time It’s Real – Buddy Rogers and His Famous Swing Band / Bob Hannon, v.
You’re A Real Sweetheart – Abe Lyman AHO / Phil Neely, v.
Only Love Is Real – Ben Selvin AHO / Smith Ballew, v.
Shepherd’s Serenade – Leo Reisman AHO / Frank Luther, v.